Sailing is in my earliest memories. I remember watching the sailboats at the Yacht Club when I was just three years old, wrapped up in a towel and enjoying the warmth of the sand and sun and my mother's arms. I remember driving down Main Street in my hometown and seeing Seneca Lake spotted with white sails: a Sunday afternoon regatta. 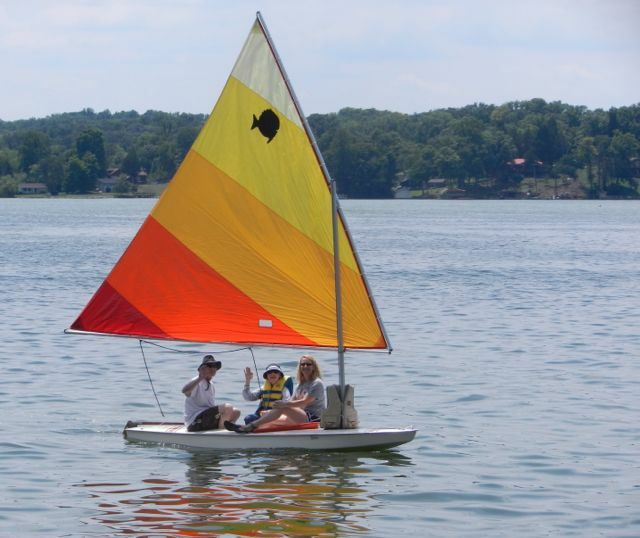 Within a few years after moving from Southern Illinois to the Finger Lakes region of New York, we bought our own sailboat, lovingly known as The K-Boat. Not long after that we bought a Sunfish. My parents and brothers had taken sailing lessons, and by the time I was 12 I'd had several years of lessons already. Most of the lessons revolved around being hot, cranky, tired, and then capsizing the boats. I knew nothing. One afternoon when I was about 13, my third brother took me out on our Sunfish and taught me to sail. All those years of lessons may have given me proper names for sails and such, but my brother made me understand the feel of wind and waves, the language of the sail itself. Seneca Lake is a big, deep lake, two miles across and 700 feet deep. Now I live in Tennessee, which I love with almost all my heart. But the lake a couple miles away is just a Tennessee Valley Authority lake, created to generate electricity decades ago by harnessing the power of the Tennessee River. The lakes are beautiful in the summer, but nearly as ugly as strip mines in the winter when the water level is lowered. I resisted sailing on this lake for a long time. But you can sail on these lakes, even if the wind isn't as strong and the shores are too close. 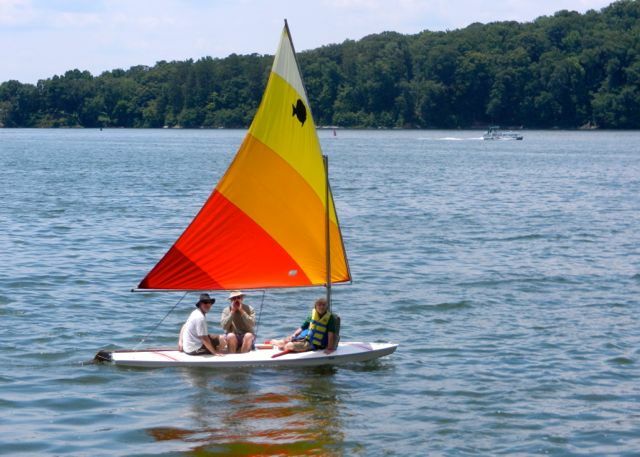 For Father's Day this year, my third brother brought his own Sunfish over and we spent the afternoon sailing. My youngest son is a natural sailor, and my brother is already teaching him. For my father, who is 87, sailing is still easy. He is nimble and strong, easily in the shape of a healthy man in his 60s. But the real joy of the day was sailing with my mother. She is 85 years old and full of aches and pains, but still she squatted down and slid off the dock into the little boat. She was glowing. She was joyous. Sometimes it takes awhile to get the vision of perfection out of one's memory in order to enjoy what is here and now. Amazing! I need to get on a boat STAT! I just LOVE that your parents are still willing to live life...good for them!